I have owned so many hair straighteners that its insane. I'm always on the look out for a new and improved straightener because I don't like wearing my hair curly. Moreover, I hate the time it takes to dry it. So I normally wash my hair the night before, let it air dry and straighten it the next morning after my shower. In a straightener I always look for a few things. First, how high the heat goes. Though I have pretty thin hair, I still need it to get up to at least 400F in order to get the curls and waves out. Second, It needs to be ceramic and not metal or steel on the plates as that will burn my hair to a cinder. Lastly, it needs to be functional. I need the part mouth to open wide enough where I don't struggle to get my hair in and the dials on the machine need to be easy to use. 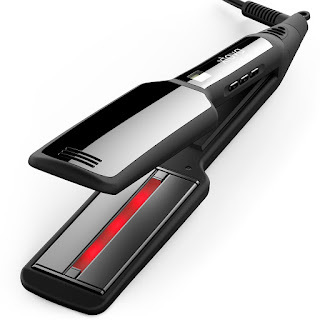 What I loved about this machine is how straight it made my hair in minutes. I normally take 25-30 minutes to straighten my hair. This took me 15-20 minutes to achieve this look without burning my hair. The heat setting on this went to 400+ with no problem in 1-2 minutes flat. The infrared really helped to not burn my hair and it came out looking shiny and healthy. It literally made my hair in one to two max swipes which was awesome! Now, what I didn't like about the machine were a few things. First, the dials are on the side of the handle. Due to this, I ended up turning off the machine a handful of times because you can only hold the machine from the bottom part of the handle and not the middle. Placing your hand around the middle of the handle causes it to either turn off or you end up turning up or down the heat dials. Second, the mouth was not wide enough. If you have really thick hair, you will have to put very small amounts to get your hair through the opening. I don't like being limited in that aspect because the amount of time I spent trying to figure that out was wasteful. I could of straightened my hair faster if it wasn't for that. Outside those two issues, this straighten was great to use and works well with people who don't have very thick hair but thinner hair in order to get it into the mouth piece. FTC: This product was sent for review. However all opinions are my own and I was not paid for this post. My daughters have several hair straighteners and they use them often. I will have to show this one to them.